*yeah - I bought the curry paste and the naan from local shops, but I did all the cooking! 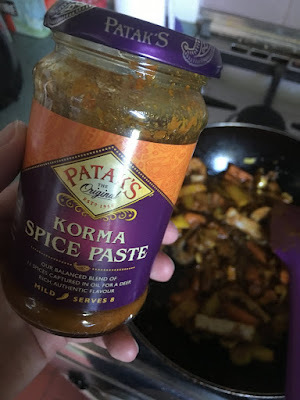 While shopping for the items for the Disappointment Wars review I happened to pick up a little Indian red onion to go with the Patak's Korma Spice paste that I'd picked up earlier in the week. 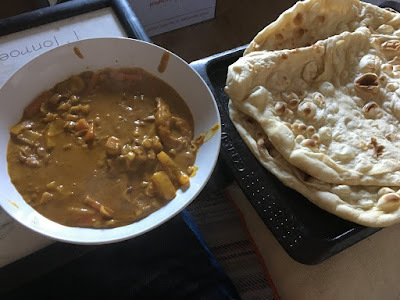 I'd been meaning to try and make a reasonably authentic curry as an excuse to buy fresh naan from the shop by the bus stop and eat them all the way down the hill back home. Realistically you need this jar, an onion, a tin of coconut milk, and whatever it is you want to put into the curry. For us this was a selection of veggies, and some of the lovely Frys vegan strips. Essentially it was like a vegan version of a chicken korma, which was great. And if I'd spotted that it was designed to serve 8 then I wouldn't have made quite as much! Here we see the mix before the coconut milk goes in, the onion has been reduced with he curry paste and the house will smell amazing for days. The veggies had water in them, the frozen vegan strips had water in them, and we added the water the recipe recommended so it was a little soupy, but my goodness it was fantastic. Two naan each (it's 4 for £1) with what was essentially two persons worth of curry each was quite a lot to handle but I did manage to get there in the end. Something I am certainly going to try again - and the fresh Indian red onion was used to great effect! 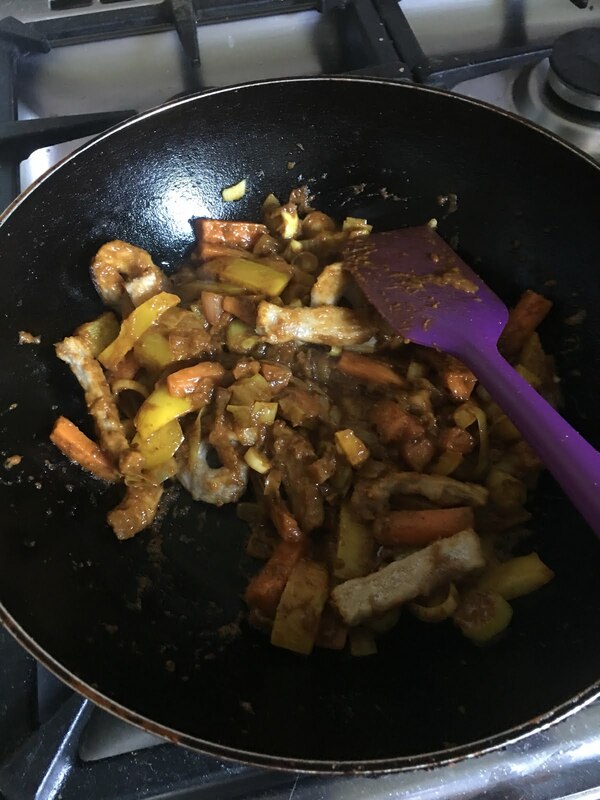 I did learn why so many people bring left over curry in to work though - if I'd thought ahead I could have used a few more robust ingredients and frozen the extra portions too! Definitely something to try during the warmer weather, and one that's almost begging to be shared with friends.